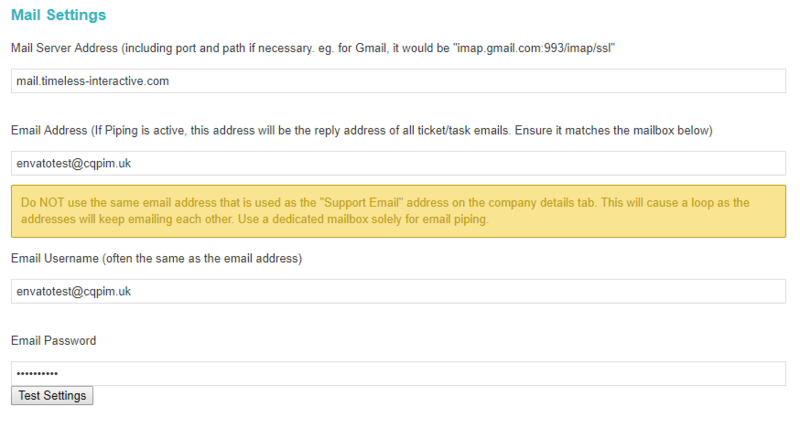 Email piping allows Projectopia to scan an IMAP mailbox and use emails there to either raise support tickets or update existing tickets & tasks. To set it up, first set up a mailbox on either you hosting or with a provider such as Gmail. Your host will be able to assist with this if you’re not sure how to create mailboxes. Once you have a mailbox, head over the the Projectopia settings and click the Email Piping tab. Enter your mail server address, email address, mailbox username and password (in a similar way to setting up your email account on Outlook for example) and click Test Settings. This will attempt to open an IMAP connection to your mailbox and will inform you of the result of the test. If the test returns “Settings are Correct”, then the mailbox is contactable, the script can log in and email data will be returned to the script. If you receive “Failed to connect to mailbox”, then move on to “Common Problems” further down this page. Task Updates – In the plugin settings, under the Tasks tab, ensure the tag is at the end of the subject bar in the Task Update Email Subject field. Support Tickets – On the Support Tickets tab, ensure that the tag is present at the end of the New Ticket Email Subject and Updated Ticket Email Subject fields. Project Messages – On the Projects tab, ensure that the tag is present at the end of the Client Message Email Subject field and the Company Message Email Subject field. Direct Messages – On the Messaging System tab, ensure that the tag is present in the New Message Email Subject field. After clicking Test Settings, the loading gif spins but doesn’t appear to do anything. This is a sign that you potentially do not have the required php_imap extension on your server, contact your host to check that it is installed and try again. It says my details are not correct even though they definitely are. It could be that your mail server is looking for a certificate and the request is not providing one. Try adding /novalidate-cert on to the end of your mail server address. Some services like Gmail block access to mailboxes from PHP scripts. This can be deactivated in your Gmail account. to find out more, click here. Everything is correct. the Test Settings button confirms the details are correct, but no ticket is raised when a client emails the piping inbox. Firstly, only emails from addresses that match up to clients or team members will be recognised by the system. If an email is received that doesn’t match up, a notification will be sent out to the sender. If everything tests successfully and the email address used to send the email does match up to a client or team member in the system, you may have an issue with WP Cron. Cron is required to trigger the piping script, and without it email piping will not work. Unfortunately some hosts block cron on their shared platforms. To test if cron is working, install WP Crontrol. Once installed go to Tools/Cron Events. A tell-tale sign that cron is not working is that each entry in the table will have (now) next to the next scheduled run time. If cron is working it will have a countdown to the next scheduled run time, eg (5 minutes). If cron is not working, contact your host. If you still cannot get email piping to work, please raise a ticket and we’ll be happy to help out.